Rubik's cube is a toy puzzle designed by Erno Rubik during the mid-1970s. It is a cube-shaped device made up of smaller cube pieces with six faces having differing colors. The primary method of manufacture involves injection molding of the various component pieces, then subsequent assembly, labeling, and packaging. The cube was extremely popular during the 1980s, and at its peak between 1980 and 1983, 200 million cubes were sold world wide. Today sales continue to be over 500,000 cubes sold world wide each year. The Rubik's cube appears to be made up of 26 smaller cubes. In its solved state, it has six faces, each made up of nine small square faces of the same color. While it appears that all of the small faces can be moved, only the corners and edges can actually move. The center cubes are each fixed and only rotate in place. When the cube is taken apart it can be seen that the center cubes are each connected by axles to an inner core. The corners and edges are not fixed to anything. This allows them to move around the center cubes. The cube maintains its shape because the corners and edges hold each other in place and are retained by the center cubes. Each piece has an internal tab that is retained by the center cubes and trapped by the surrounding pieces. These tabs are shaped to fit along a curved track that is created by the backs of the other pieces. The central cubes are fixed with a spring and rivet and retain all the surrounding pieces. The spring exerts just the right pressure to hold all the pieces in place while giving enough flexibility for a smooth and forgiving function. Puzzle makers have been creating problems for people to solve for centuries. Some of the earliest puzzles date back to the time of the ancient Greeks and Romans. The Chinese have a ring puzzle that is thought to have been developed during the second century A.D. This was first described by Italian mathematician Girolamo Carolano (Cardan) in 1550. When the printing press was invented, complete books of mathematical and mechanical problems designed specifically for recreation were circulated. From these early riddles and word problems, toy puzzles were naturally developed. In 1857, the Irish mathematician Sir William Hamilton invented the Icosian puzzle. Sometime around 1870, the famous 15 Puzzle was introduced, reportedly by Sam Lloyd. This puzzle involved numerical tiles that had to be placed in order and became extremely popular in the early twentieth century. In 1883, French mathematician Edouard Lucas created the Tower of Hanoi puzzle. This puzzle was made up of three pegs and a number of discs with different sizes. The goal was to place the discs on the pegs in the correct order. There are various puzzles that involve colored square tiles and colored cubes. Some early precursors to the Rubik's cube include devices such as the Katzenjammer and the Mayblox puzzle. The Mayblox puzzle was created by British mathematician Percy MacMahon in the early 1920s. In the 1960s, Parker Bothers introduced another cube puzzle type toy called Instant Insanity. This toy achieved a moderate level of popularity in the United States. The early 1970s brought with it a device called the Pyraminx, which was invented by Uwe Meffert. This toy was a pyramid that had movable pieces that were to be lined up according to color. Erno Rubik, an architect and professor at the University of Budapest developed the first working prototype of the Rubik's cube in 1974. He received a Hungarian patent in 1975. Apparently, it was also independently designed by Terutoshi Ishige, an engineer from Japan, who received a Japanese patent in 1976. Professor Rubik created the cube as a teaching aid for his students to help them recognize three-dimensional spatial relationships. When he showed the working prototype to his students, it was an immediate hit. Over the next few years, Rubik worked with a manufacturer to allow production of the cube on a mass scale. After three years of development, the first cubes were available on toy store shelves in Budapest. While the cube remained popular in Hungry, the political atmosphere of the time made it difficult for it to be introduced in the United States. The two men who were most responsible for making the cube an international success were Dr. Laczi Tibor and Tom Kremer of Seven Towns Ltd., London. Seven Towns licensed the Rubik Cube invention from Professor Rubik for worldwide distribution. Dr. Tibor worked within Hungry to convince bureaucrats to allow the technology out of the country. Kremer found a United States toy maker, the Ideal Toy company, who was willing to help market the product. The product was an immediate hit, and during the 1980s, over 200 million cubes were sold. Around 1983, the frenzied popularity of the cube began to wane and sales slowed drastically. It remained in small scale production until Seven Towns took over the marketing, and licensed the Rubik Cube to the Oddzon Company for the United States market in 1995. Since that time sales have steadily increased to over 500,000 units a year. The most important part in the manufacture of a Rubik's cube is designing the mold for the various pieces. A mold is a cavity carved into steel that has the inverse shape of the part that it will produce. When liquid plastic is put into the mold, it takes on the mold's shape when it cools. The creation of the mold is extremely precise. The cavity is highly polished to remove any flaws on the surface. Any flaw would be reproduced on each of the millions of pieces that the mold will produce. In the manufacture of the cube parts, a two piece mold is typically employed. During production, the two mold pieces are brought together to form the plastic part and then opened to release it. The tool includes ejector pins that release the molded parts from the tools as it opens. All the parts are molded with auto gating tools that automatically remove the parts from the sprue as it is ejected. The molds are also produced with a slight taper, called release angle, which aids in removal. Finally, when molds are designed, they are slightly bigger than the pieces that they ultimately will produce. This is because as the plastics cool, they shrink. Different plastics will have a different shrink rate, and each tool must be specifically designed for the material that will be used. The commercial cube is composed of six fixed cubes, eight movable cubes on the corners and 12 movable cubes on the edges. Each cube is one of six colors. The Rubik's cube has red, yellow, blue, green, white, and orange colors. In its solved state, each color is on only one face. When the cube is rotated, the edges and corners move and the cube becomes scrambled. The challenge of the puzzle is to restore each cube to its original position. The cube is extremely challenging because there are slightly more than 43 quintillion (4.3 × 10 19 ) possible arrangements, and only one solution. The standard Rubik's cube has sides of about 2.2 in (5.7 cm) per square. Various other sizes have also been produced such as a 1.5 in (3.8 cm) mini cube, a 0.8 in (2 cm) key chain micro cube, and a 3.5 in (9 cm) giant cube. While the standard cube is a 3 × 3 × 3 segmentation other types have also been introduced. Some of the more interesting ones include the 2 × 2 × 2 cube, the 4 × 4 × 4 cube (called Rubik's Revenge) and the 5 × 5 × 5 cube. The shape has also been varied and puzzles in the form of a tetrahedral, a pyramid, and an octahedral are among types that were produced. The Rubik's cube also led to the development of game derivatives like the Rubik's cube puzzle and the Rub it cube eraser. The individual pieces that make up the Rubik's cube are typically produced from plastic. Plastics are high molecular weight materials that can be produced through various chemical reactions called polymerization. Most of the plastics used in a Rubik's cube are thermoplastics. These compounds are rigid, durable, and can be permanently molded into various shapes. The plastics used in the Rubik's cube are acrylonitrile butadiene styrene (ABS) and nylon. Other plastics that might be used include polypropylene (PP), high impact polystyrene (HIPS), and high density polyethylene (HDPE). For decorative purposes, a colorant is typically added to the plastic. The pieces of a Rubik's cube are typically black. During production, colored stickers are put on the outside of the cube to denote the color of a side. The plastics that are used during production are supplied to the manufacturer in a pellet form complete with the filler and colorants. These pellets can then be loaded into the molding machines directly. The manufacture of the first Rubik's cube prototypes was by hand. During the late 1970s, methods for mass production were developed and continue to be used today. Typically, production is a step by step process that involves injection molding of the pieces, fitting the pieces together, decorating the Rubik's cube, and putting the finished product in packaging. 1 When production is initiated, the plastic pellets are transformed into Rubik's cube parts through injection molding. In this process, the pellets are put into the hopper of an injection molding machine. They are melted when they are passed through a hydraulically controlled screw. As the screw turns, the melted plastic is shuttled through a nozzle and physically forced, or injected, into the mold. Just prior to the arrival of the molten plastic, the two halves of the mold are brought together to create a cavity that has the identical shape of the Rubik's cube part. This could be an edge, a corner, or the center piece. Inside the mold, the plastic is held under pressure for a specific amount of time and then allowed to cool. While cooling, the plastic hardens inside the mold. After enough time passes, the mold halves are opened and the cube pieces are ejected. The mold then closes again and the process begins again. Each time the machine moulds a set of parts is one cycle of the machine. The Rubik's cube cycle time is around 20 seconds. 2 After the cube parts are ejected from the mold, they are dropped into container bins and hand inspected to ensure that no significantly damaged parts are used. The waste sprue material is set aside to be reused or scrapped. Waste material can be ground up and melted again to make new parts, however reground material can degrade and cause poor quality parts. Rubik's cubes are always made from virgin material and never use reground waste plastic. 3 The Rubik's cube parts are taken to an assembly line. In this phase of production, the individual cube pieces are put together. Starting with the nylon core, each ABS center cube is riveted to the core with a spring spacer. The rivet is carefully controlled with a depth stop to ensure the spring is compressed just the right amount. Each center cube has a plastic cover that is glued on to hide the rivet. One of the six center cubes is left until the last part of the assembly. The ABS edges and corner pieces are individually stacked around the core. The cube is built from the bottom up and the last piece to be assembled is the final center cube which is again riveted into the core with a spring spacer and the final cap is glued on. 4 Next, the Rubik's cube faces need to be labeled. The labels are made from sheet polypropylene material that is printed with the colors. The printed sheet PP is then laminated with a clear PP protective covering. The material is then die cut with the labels wound onto rolls. The labels are made with all nine squares of each face exactly aligned. This way the labels can be perfectly aligned when they are applied to the cube. 5 After all the labeling is completed, the cubes are put in their final packaging. This can be a small box that has an instruction booklet included or a plastic blister pack with a cardboard backing. The package serves the dual purpose of protecting the Rubik's cube from damage caused by shipping and advertising the product. The Rubik's cube packages are put into cases and moved to a pallet. The pallets are then loaded on trucks and the products are shipped all over the world. To ensure that each toy will be a high quality product, quality control inspectors check the product at each phase of production. The incoming plastic pellets are chemically tested to determine whether they meet certain chemical specifications. These include checks on appearance, color, melting point, toxicity, and molecular weight. The quality of the individual parts are also inspected just after exiting the mold. Since thousands of parts are made daily, a complete inspection would be difficult. Consequently, line inspectors may randomly check the plastic parts at fixed time intervals and check to ensure they meet size, shape, and consistency specifications. This sampling method provides a good indication of the quality of the overall Rubik's cube production run. Things that are looked for include deformed parts, improperly fitted parts and inappropriate labeling. While visual inspection is the primary test method employed, more rigorous measurements may also be performed. Measuring equipment is used to check the length, width, and thickness of each part. Typically, devices such as a vernier caliper, a micrometer, or a microscope are used. Just prior to putting a cube in the packaging it may be twisted to ensure that it holds together and is in proper working order. This can be done by hand or by a turning machine. If a toy is found to be defective it is placed aside to be reworked later. The Rubik's cube starts with a nylon core. The plastic squares are then attached from the bottom up with the labels being attached last. recently made a significant come back. This has been a result of impressive marketing efforts by Seven Towns. In the future, this marketing effort should continue to increase sales of the Rubik's cube. 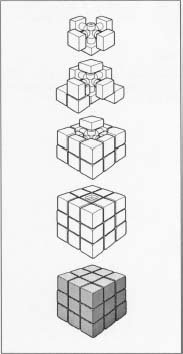 In addition to the cube, other derivative puzzles have been introduced including the Rubik's snake, Rubik's triamid, and the Rubik's magic folding puzzle. It is expected that new variants will also be introduced in the near future. Chabot, J. F. The Development of Plastics Processing Machinery and Methods. Brookfield: Society of Plastics Engineers, 1992. Othmer, Kirk. Encyclopedia of Chemical Technology. Vol. 22, 1992. Rubik, E. Rubik's Cubic Compendium. Oxford University Press, 1987. Seymour, R., and C. Carraher. Polymer Chemistry. New York: Marcel Dekker, Inc., 1992. Seven Towns Ltd. Rubik's Online Web Page. 27 September 2001. < http://www.rubiks.com >. United States Patent no. 4378116. United States Patent no. 4471959. Virtual Puzzle Museum Web Page. 27 September 2001. < http://www.virtualpuzzlemuseum.com >.